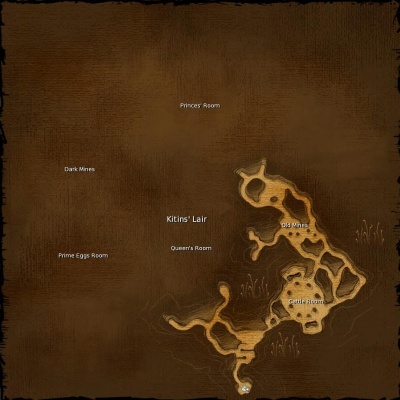 A map of the Kitin's lair. The Kitins' Lair is the high-end zone of the game: The place that was specifically designed to have the most evil creatures and be suicide to all but the most powerful players. It's also the newest zone, only having been implemented in December 2009. It's not even fully implemented yet, currently only the first three rooms are accessible: The entry room, the Cattle Room and the Prime Eggs room. The other areas that appear on the map, the Old Mines, the Dark Mines, the Princess' Room and the Queen's Room are not open yet. The Kitins' Lair is accessible only through Almati Wood, which in turn can only be reached by being teleported from a Karavan Temple or a Kami Sanctuary, or by using one of the special pacts available to some occupations. Bosses: The Lair houses the Terminator Kipucka, the Terminator Kipee, and Kizokoo. Rites: Both the Kizoar Rite and the Kincher Rite have their begin and their end inside the Lair. Occupations: 4 of the 8 occupations take place mostly inside the Lair: Butcher, Medic, Larvester and Scrollmaker. There's only one NPC to talk to down here: Ana Ryon, who is right at the entrance and gives out the Kizoar and Kincher rites, as well as playing a role in the Larvester occupation. Right next to her are Lano Fergoto and Xan Mi Chong who play roles in the Larvester and Scrollmaker occupations, respectively. The only other NPCs are Ranger guards, and some wanderers who are part of the Medic occupation. While the Lair certainly has some of the most meanest kitin around and will be a quick death to any inexperienced player, it is not nearly an impossible death-trap. The entrance even has several ranger guards that will assist you if you're under attack nearby and who can handle pretty much anything down there. And the rest of the Lair, while definitely dangerous, is not particularly more dangerous than the meanest corners of Grove of Confusion or Lagoons of Loria. The following is a more detailed account of the different sections of the Kitins' Lair. As this includes tips on how to navigate the lair, beware of spoilers! 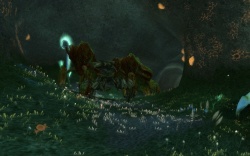 The entire Lair is of the Prime Roots ecosystem, thus foraging there uses the Prime Root foraging skill and all Kitin bosses there drop Prime Root materials. The entrance of the Kitin's lair. Just behind the entrance of the lair is the only section that's safe. There are 7 Ranger guards here, 5 melee and 2 mages, that will assist any player who is under attack at the entrance and who can handle pretty much anything you can pull at them. Ana Ryon, Lano Fergoto and Xan Mi Chong are also at the entrance. Ana Ryon gives out the Kizoar and Kincher rites, and takes in larva as part of the Larvester occupation. Lano Fergoto also takes in larva as part of the Larvester occupation, while Xan Mi Chong takes in larva as part of the Scrollmaker occupation. The first area of the Lair you reach once you head in further has no official name, so is mostly referred to as the entry area. It consists of the large open room right behind the entrance, and some tunnels that stretch out in both directions. Kipesta patrol this area in groups of 4. They move fast and can spot homins from quite far away, and the narrow tunnels make them almost impossible to avoid. Thus the recommended way to deal with them is to pull them to the guards at the entrance, then run past while they're dead. You may have to repeat this several times as there are several Kipesta groups on patrol. A Terminator Kipucka also patrols here. It doesn't move as fast, but can still block tunnels. It can also be pulled to the guards to dispatch of it. At the east end of the room is a kitin mound where periodically a Kincher will emerge from with a group of herbivores, herd the herbivores to the Cattle Room, leave the herbivores there and return back to the mound to disappear in it again. This Kincher will drop what it's doing to kill you if it spots you, so is a danger if you're in the tunnels between the entry room and the Cattle Room. If the Kincher is killed, the herbivores will disappear back into the mound, and 2 Kinchers will emerge with the next group of herbivores. The entry room holds Insect Larva of all grades up to quality 30 for Larvesters and Scrollmakers at grade 1. The plain, average, prime and select all pop in different locations, and may not be available at all times. The entry room and the tunnels around it have Toopetz Gret, Amoeba Dan, Ploomweed Dash and Cokamool Frez for Medics and Scrollmakers to kill at grades 1 and 6. 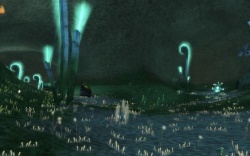 Dexus Lyron, Alizi Ferro, Dida Mc'Dolonay and Zin Di-Dao wander through the entry room and the tunnels around it. They need to be interacted with as part of the Medic occupation at all grades. The kitin ignore them and they're irrelevant if you're not a Medic. The Cattle Room is just east of the entry room. It's in the shape of a large bowl with the cattle in the middle and kitin patrolling around the edge. It's for the most part quite a safe place until someone does something to make the kitin raise the alarm, which turns the whole Cattle Room into a deathtrap until things quiet down again. In the bowl in the center of the Cattle Room is the cattle. There are bodocs, armas, aranas, madakams and ploderos. Note that they are not native Prime Roots creatures, but are 'imported' from aboveground. You can kill and quarter the cattle, and in fact have to for the Butcher occupation. Herbivores of the same species are social with eachother and will comes to eachother's aid if you attack one of them. They also don't respawn until all specimens of the same species are killed. Furthermore, if any kitin spot you fighting herbivores, they'll raise the alarm and kill any homin in the Cattle Room. Thus, it's recommended to kill herbivores only in the very middle of the room where the Kipees won't spot you. Sometimes a Kincher may deliver another group of herbivores to the cattle room, like gubanis or lumpers. But these aren't native to the cattle room, aren't needed for any butcher mission and won't respawn. They'll just wander around for a bit and then die. Groups of Kipees patrol around the edges of the Cattle Room. They're generally harmless and won't attack you unless attacked first. However, if they see any homins fighting their cattle, or if they're attacked directly, they will raise the alarm. Once the alarm is raised, all Kipees in the room will attack any homin on sight until things calm down again. Large groups of Kirosta sit in their own rooms to the north and south of the main room. Though they'll attack any homins they see, they're usually easy enough to avoid by just staying out of those rooms. However, if the alarm is raised, they'll rush out of their rooms into the cattle room and kill any homin in there. Periodically a Kincher will emerge from the entry room with a group of herbivores, leave the herbivores in the cattle room and return back to the entry room. This Kincher will drop what it's doing to kill you if it spots you, so is a danger if you're on the west side of the Cattle room. A group of aggressive Kizoar that patrols the old mines periodically wanders by the east side of the Cattle Room, and is a danger if you're on the east side. All the more because if the Kipees spot the Kizoars attacking you, it'll set off the alarm in the Cattle Room. The west side of the Cattle Room holds Insect Larva of all grades up to quality 60 for Larvesters and Scrollmakers up to grade 2. The east side holds them up to quality 90 for Larvesters and Scrollmakers up to grade 3. The plain, average, prime and select all pop in different locations, and may not be available at all times. The west side of the Cattle Room has Toopetz Gret, Amoeba Dan, Ploomweed Zuc and Cokamool Kloro for Medics and Scrollmakers to kill at grade 2. The east side of the Cattle Room has Toopetz Dual, Amoeba Tolz, Ploomweed Zuc and Cokamool Kloro for Medics and Scrollmakers to kill at grade 3. East of the Cattle Room are the Old Mines. At the moment only a few tunnels of the Old Mines are open and for most purposes they serve mostly as an extension to the Cattle Room. 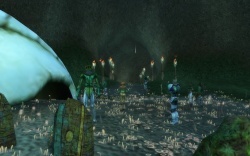 Groups of Kibans wander around the Old Mines. They're generally harmless and won't attack you unless attacked first. However, if they see any other kitin fighting you, they will join in and attack you as well. One group of aggressive Kizoars patrols the Old Mines. They do not move very fast but do spot you from quite far away, and cannot be avoided in the narrow tunnels. It's recommended to watch your compass for them and run the other direction when you see them coming. Also be warned that running into the Cattle Room after they've spotted you will set off the alarm there. Kizokoo also pops in the Old Mines. Be aware that he and his guards are also aggressive, so don't come too close if it's up. Luckily they stay in the same place. Killing Kizokoo requires a complicated sequence to be followed and isn't recommended for inexperienced teams. 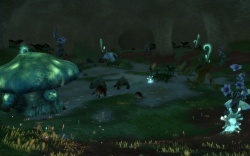 The Old Mines hold Insect Larva of all grades up to quality 90 for Larvesters and Scrollmakers up to grade 3. The plain, average, prime and select all pop in different locations, and may not be available at all times. There is also a skull filled with forage sources in a corner somewhere. This plays a part in the Kincher rite. The sources can't be harvested. The Old Mines has Toopetz Dual, Amoeba Tolz, Ploomweed Zuc and Cokamool Kloro for Medics and Scrollmakers to kill at grade 3. The prime eggs room entrance. West from the entry room, the road to the Prime Eggs Room is a single long tunnel with nowhere to hide. There are no resources here and no plants. All there is is a nice view of the depths below. The Kipesta groups and the Terminator Kipucka that patrol the entry room also patrol this tunnel. 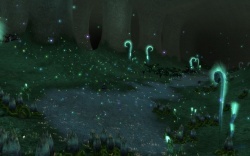 And if you encounter them here, there's no way to avoid them in this narrow tunnel. You'll have to either make sure you've pulled them all to the guards at the entrance before making the run to the Prime Eggs Room, or be able to survive running past them and then able to outrun them before you reach the Prime Eggs Room. The Prime Eggs Room is far west of the entry room, and not on the map. It's in the shape of a narrow gallery running from north to south, with large open rooms both to the east and west of it. The edges of both rooms are largely safe, the gallery in the middle is much more dangerous. The Eggs are in clutches around the edges of both rooms. Most Eggs are just scenery objects, but one in each groups can be attacked and killed. Beware that these Eggs will release a cloud of toxic gas upon death, and that killing them angers the Kipees. If one of the eggs is destroyed, the Terminator Kipee spawns after a few minutes. Groups of Kipees patrol the Prime Eggs Room, both the gallery in the middle and the rooms on both sides. They're generally harmless and won't attack you unless attacked first, or unless someone destroys an Egg (egg must release a toxic gas to valid this condition). If an Egg is destroyed, a group of Kipees will become aggressive and rush to the scene, attacking anyone nearby. Groups of Kipuckas also patrol in the same pattern, but these will attack any homins on sight. Be careful as they're easily mistaken for the Kipee groups at a glance. Also be aware that their patrol routes are irregular, and they may at any time decide to suddenly turn around or head in another direction. In the far corners of the room, you are safe from being seen by the Kipucka unless someone drags them to you. On the far south side of the room, where the Kipucka won't see you, you may instead be seen by the Kipesta groups or the Terminator Kipucka that patrol the tunnel leading to the Prime Eggs Room. Though they don't enter the Prime Eggs Room itself, they can spot homins from quite far away. If you're hiding in the far south of the Prime Eggs Room, watch your compass for these Kipesta groups approaching. The Terminator Kipee will enter the room from the north if any eggs are destroyed. It will calmly replace the eggs and then disappear again. It is harmless unless attacked directly. The south side of the Prime Eggs Room holds Insect Larva of all grades up to quality 120 for Larvesters and Scrollmakers up to grade 4. The plain, average, prime and select all pop in different locations, and may not be available at all times. The north side of the Prime Eggs Room holds Insect Larva of all grades up to quality 150 for Larvesters and Scrollmakers up to grade 6. One of these only pops in the middle of the gallery and is particularly hard to obtain safely. The south side of the Prime Eggs Room has Toopetz Gret, Amoeba Shon, Cokamool Tiny and Ploomweed Zuc for Medics and Scrollmakers to kill at grade 4. 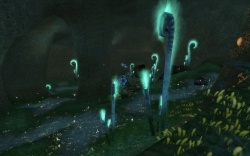 The north side of the Prime Eggs Room has Toopetz Try, Amoeba Shon, Cokamool Tiny and Ploomweed Dash for Medics and Scrollmakers to kill at grade 5. This page was last edited on 27 December 2018, at 15:09.